Posted by rogerhollander in Canada, Education, First Nations, Genocide. Roger’s note: for the most part the living conditions for Canada’s First Nations Peoples are a disgrace, characterized by high degrees of poverty, sickness, alcoholism and violence (primarily against women). Do not look for truth much less reconciliation from Canada’s current hateful Tory government. The word “cultural” seems to suggest that the residential school system was designed to destroy cultures but not people, a fact far from reality. 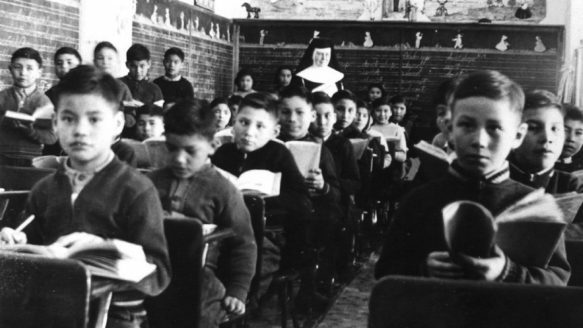 A classroom of St. Joseph’s Residential School in Cross Lake, Man., in 1951. Residential Schools were predicated on the notion that Indigenous children were less human than other children, writes Jesse Staniforth. Perhaps the most controversial issue to follow the conclusion of the Truth and Reconciliation Commission (TRC) has been the affirmation that the government of Canada had committed “cultural genocide” against Indigenous people through the Indian Residential Schools (IRS) system. The word “cultural” seems to suggest that the IRS system was designed to destroy cultures but not people, a fact far from the reality of Residential Schools. “Cultural” is a civilizing adjective: it says that our policies were not truly evil, just deeply misguided. Canada did not pack Indigenous people onto train cars and send them to be gassed, or march them into fields and execute them with machine-gun fire. However, our country committed not “cultural” genocide, but just regular genocide. We forcibly took children from families — sometimes at gunpoint — and flew them to remote locations they could not escape — sometimes in tiny handcuffs — where they were submitted to a program of forced labour and “education” designed to destroy their cultures and civilizations. This desire to destroy cultures seems to be the reasoning for various public figures’ use of the adjective “cultural” before genocide. The other reason, I presume, is that some cling tightly — and childishly — to the idea that Canada has always been on the side of goodness and justice, and they find it very hard to accept, admit, and announce that we are a country that committed a program of genocide that lasted for many decades. Yet Residential Schools were predicated on the notion that Indigenous children were less human than other children, so they were worked like animals in the slave labour many schools mandated. For the same assumption of their lesser humanity, children in the IRS system were often deliberately malnourished and kept in cramped, filthy quarters. When they subsequently fell sick as a result of this racially motivated neglect and mistreatment, they were not provided adequate medical treatment and died by the thousands. The Canadian government was happy to leave these children to die because they were Indigenous. In the early part of the century we stopped keeping track of how many children died: the commission concluded this was because it made us look bad as a country. We did not change any of the conditions — we just changed the habit of keeping track of the children our system killed. And when Indigenous children died, we often did not consider them human enough to inform their families, to record their genders or their ages or the causes of their deaths, or to mark their graves. Which part of this sounds civilized enough that it deserves to be mitigated by the adjective “cultural”? I’m not talking about the sexual violence. That was closely connected but it wasn’t part of our state policy. The rest was, and it constituted a policy of genocide. As a Canadian journalist working in Indigenous media, I have faced the fact that the history of this country is difficult and tragic. My great-grandfather was decorated for valour at Vimy Ridge at the same time as Aboriginal children were being taken at gunpoint to have their culture beaten and starved out of them. National histories are too big and complex to love simply. I’m not so attached to my country to contort myself into defending our history of genocide — and I’d like to ask those who are: how would admitting that our country was guilty of this crime against humanity change your relation to this nation, to yourself, and to Indigenous people? As of the closing of the TRC, the facts of the Canadian genocide of Indigenous peoples are now a part of the official record of this country’s history, both for those who wish to face it, and those who wish to pretend it isn’t there. These facts stand and will not change, because they are in the past. In the present day, it is only Canadians who can change — and will have to change — in order to acknowledge the disgraceful but fixed facts of our history. Jesse Staniforth is a Montreal-based freelance journalist and a regular contributor to the Nation magazine, serving the Cree Nation of Eeyou Istchee and the communities around James Bay.